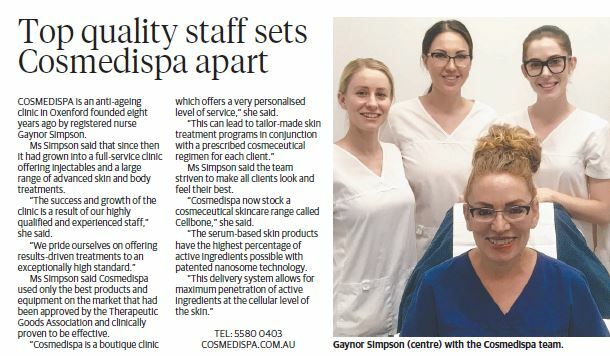 Gold Coast Bulletin showcasing CosMediSpa with an interview of clinic owner – Gaynor Simpson. Our professional service and dedication to excellence means CosMediSpa is widely recognised as one of the best skin care clinics on the Gold Coast. As a leader in cutting-edge anti-ageing treatments and techniques along with being a boutique style clinic we are proud to showcase a small team of three Dermal Therapists who are equipped with the knowledge and professionalism to give you that personalised treatment plan while having the ability to be there step by step along your skin care journey.